S.O.S. 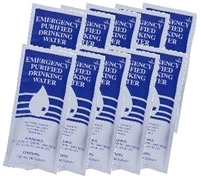 Food Labs Emergency Purified Drinking Water 10 pack. Each heavy duty foil sealed pouch contain 4.227 FL. oz. (123ml.) of purified drinking water. 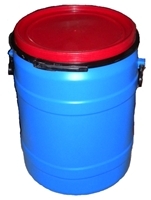 These emergency purified water packs are made with a five year storage life. Right now these are on sale because this is an older lot from October 2012. It still has a good two years plus before it even becomes questionable. But we are selling them at a reduced rate due to their half life. Made specifically to work with S.O.S. Food Labs food rations for optimal water/food ratio. We have put these bags to the test and froze, thawed, froze etc multiple times without bag rupturing. Perfect to store in your bugout bag. Limited supply at this price. 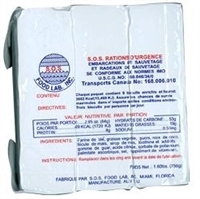 These 72 hour emergency food ration packs are in use by multiple U.S. government agencies. These were manufactured in late 2012 and are set to expire in late 2017. Due to their close date we are selling them at a discounted rate, regular price $9.99 each. Each pack contains 9 individually packaged 400 Kcal energy bars. S.O.S. 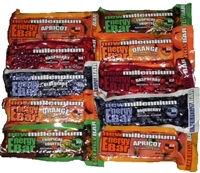 Food Labs Millennium Energy Bar 10pk. These are said to have a 5 year shelf life, they were purchased by us in December 2012 so they have a couple good years left. Packages are airtight and ready for immediate use or to be stowed away for a rainy day. Each 10pk will include a variety of 5 different flavors (two each). Those flavors may differ from the ones pictured but they may also be the same.